Seeing is Believing This sample manual to teach Internet Marketing is in MS Word format. Our customizable training materials are your best option for developing the skills of your Internet Marketing professionals. The courses included in this bundle give you the ability to teach your students how to build a digital profile. 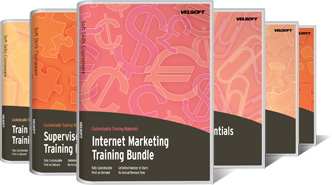 We've included four professionally designed courses that you can use to deliver Internet Marketing training. This bundle covers all the essentials: creating a marketing plan, writing Internet content, search engine optimization, leveraging social media, and so much more. If you're looking for quality, value, and relevant materials, our Internet Marketing bundle is a perfect choice. Our special bundle pricing gives you more flexibility with your training budget. Join many other satisfied trainers who have used our materials to put on a top-notch course, while saving time and money! These Internet Marketing training materials include plenty of hands-on activities to ensure that you give students skills that they can apply right away when they return to the workplace. Plus, you can customize these materials to maximize learning for your students. They will walk away from your training workshop feeling like they have really learned something new and excited to apply their new skills. What more could a trainer ask for?